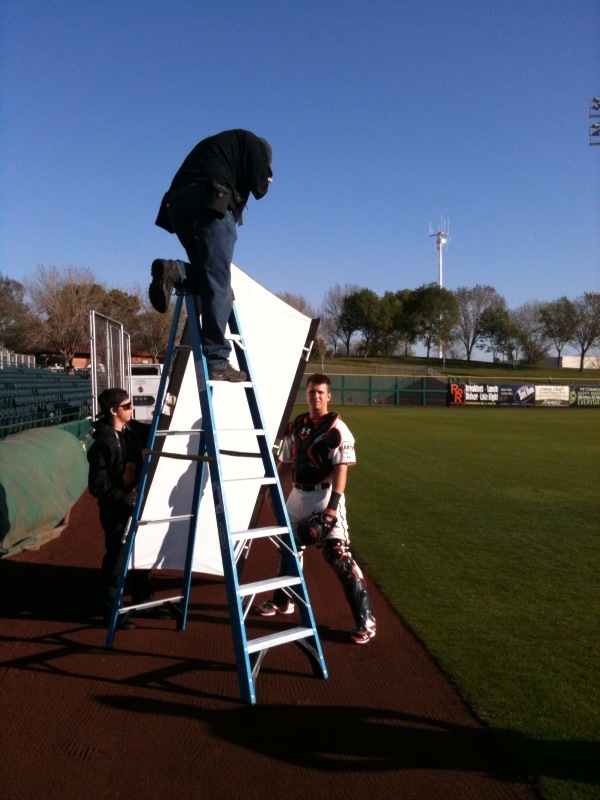 Spring Training is a busy time for players. Besides focusing on the field and preparing for the grind of a 162-game schedule, players have several other obligations such as daily media requests and signing lots and lots of autographs. 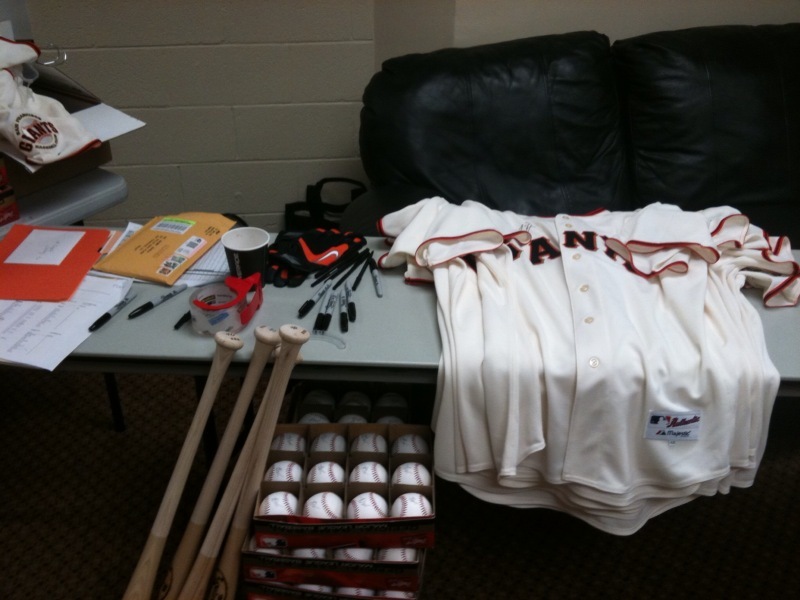 Every spring, front office staff members from the Giants’ Community Relations department fly down to Scottsdale and set up in a room in the home clubhouse where players come by and sign memorabilia, ranging from baseballs, bats, jersey’s and pictures. 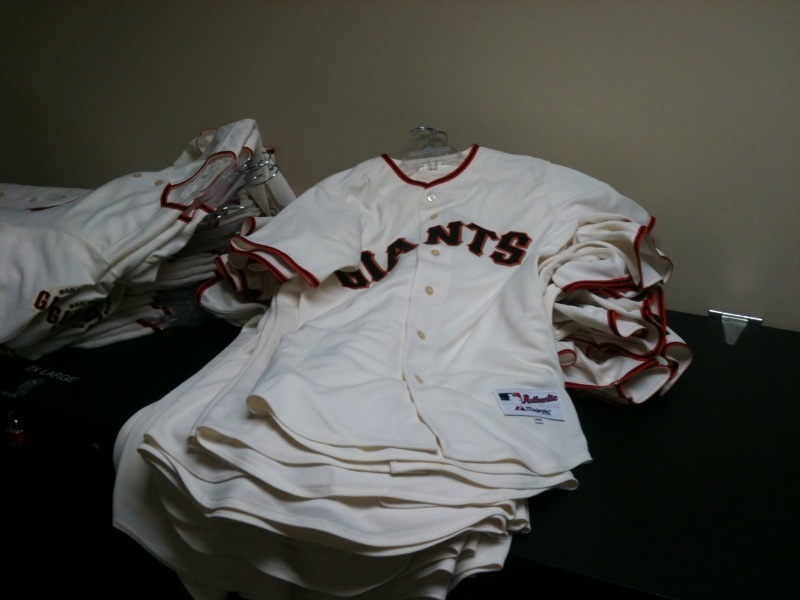 They receive a list of how much to send down from other departments within the Giants’ organization, as each department receives an allotment of autographed items to use for sponsors, community events, guest services, consumer marketing, baseball operations, etc. 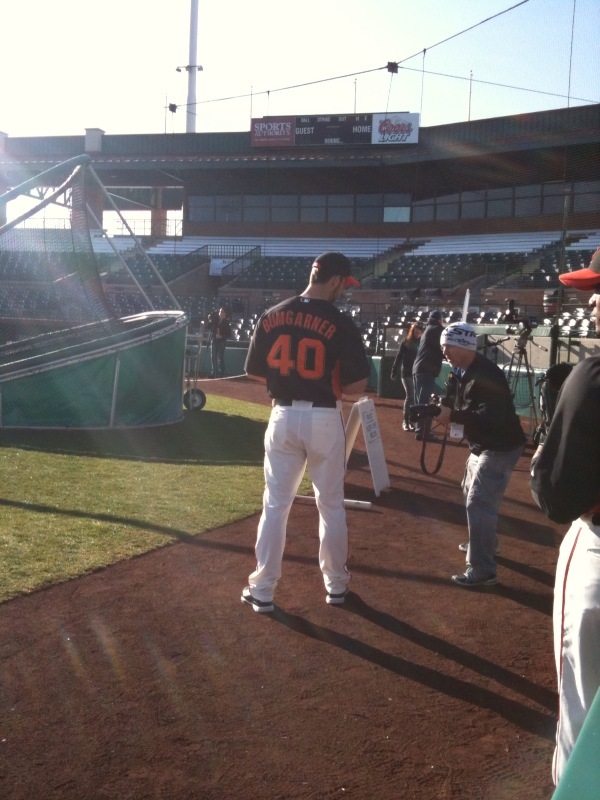 Hundreds of boxes of official Major League baseballs and bats, and a few boxes of jerseys and photos for each player on the roster are sent to Scottsdale Stadium and each player spends nearly one to two hours a day either before practice or after, signing and signing and signing. 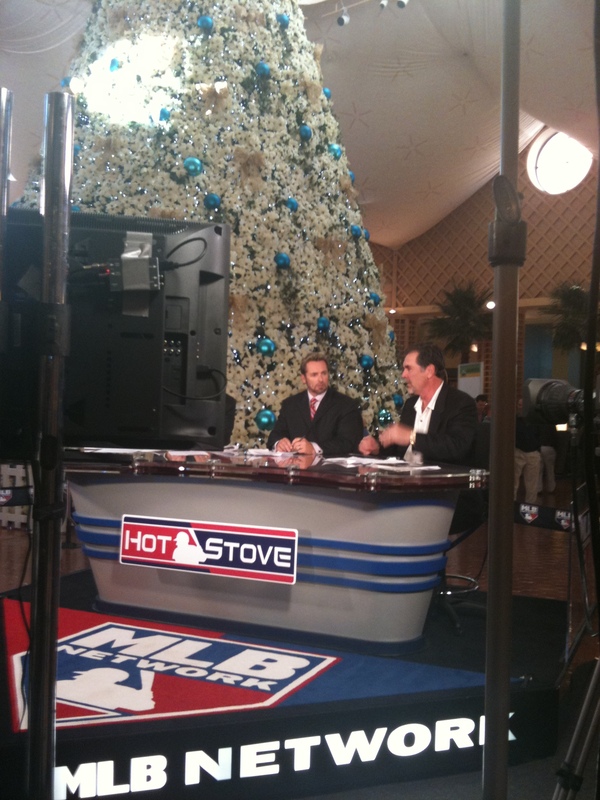 A representative from MLB is always in attendance to authentic each signed item. How much does a player have to sign? 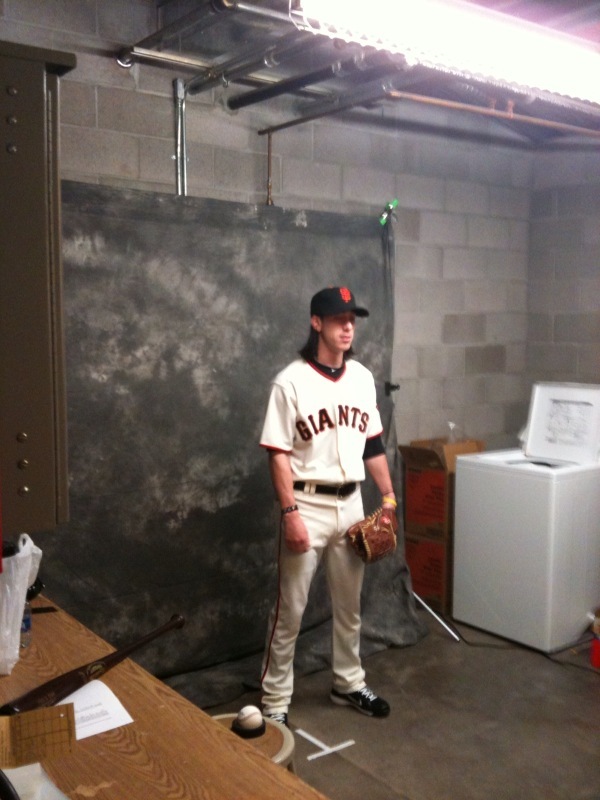 Well, this year, Tim Lincecum has 25 dozen baseballs, 10 bats, 39 jerseys and 53 photos. He usually spreads it out over a couple of days so he’s not spending a ton of time signing. 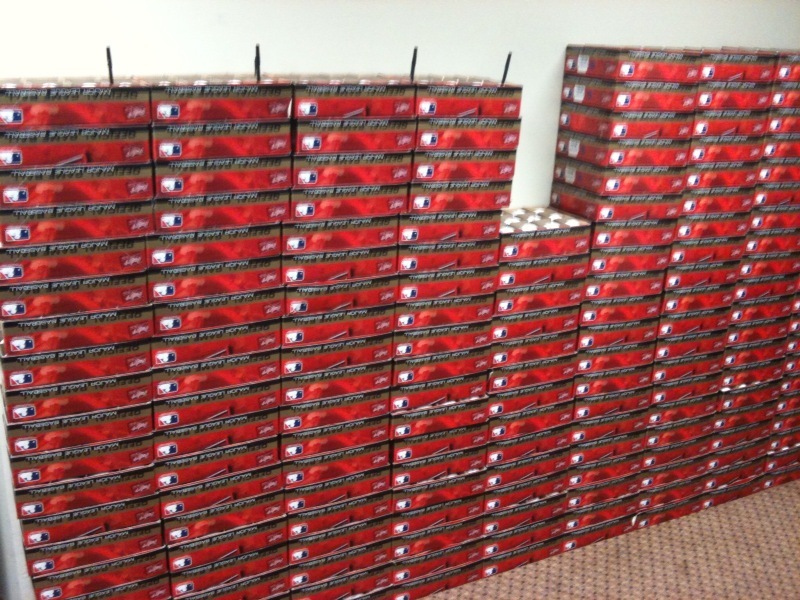 Buster Posey wins the award for having to sign the most stuff this spring, as he has 31 dozen baseballs, 82 bats, 47 jerseys and 62 photos, by far the most of any Giant. 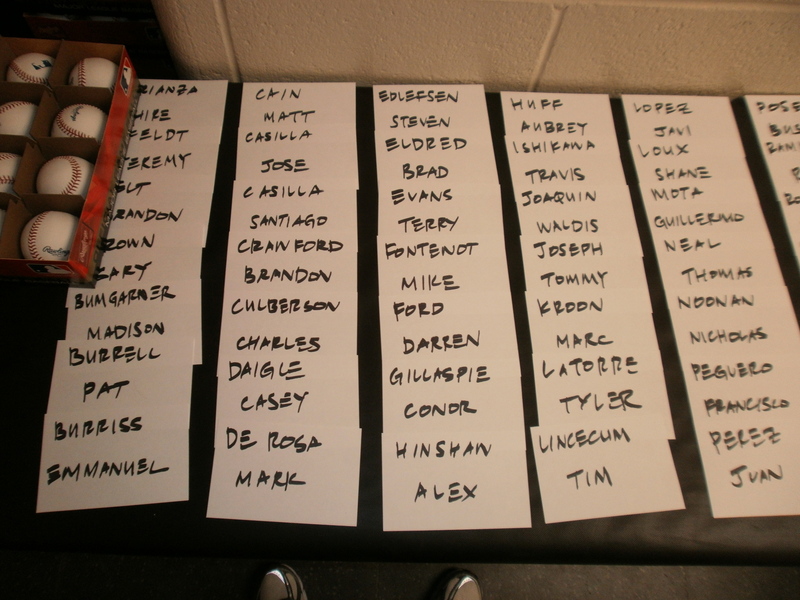 Most of the players will get everything signed by the end of this week before the games start next Friday. 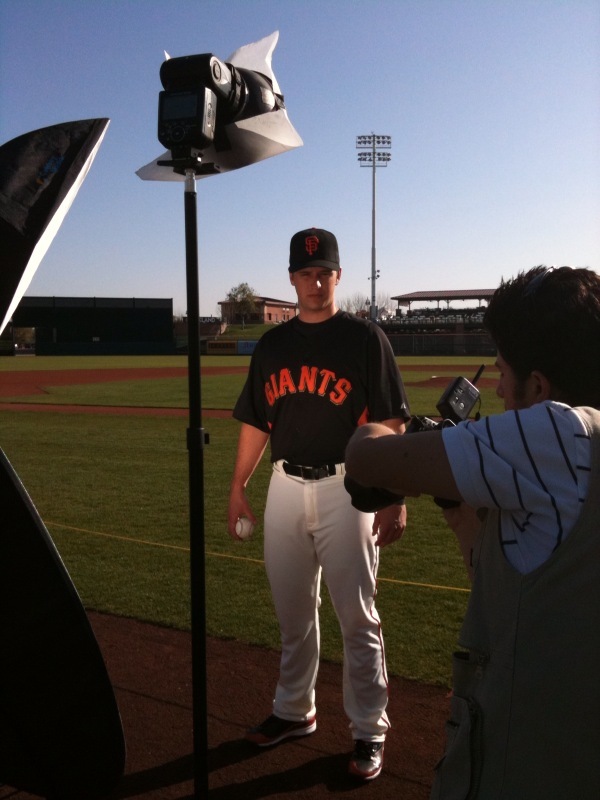 Today was the first official workout day for Giants pitchers and catchers here at Scottsdale Stadium. 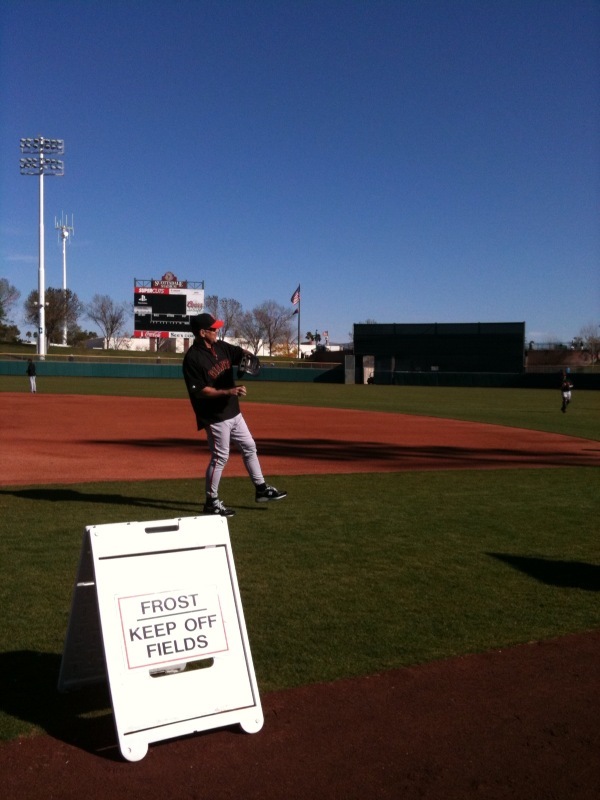 In past springs, manager Bruce Bochy would begin his workouts around 9:00am with players reporting to the stadium anywhere between 7:00-8:30. However, this season the workouts are starting an hour later at 10:00am to let the field dry out from the frost that covers the grass each morning. This is a big deal because it gives everyone (players, coaches, front office staff and media) an extra hour of sleep each night. Players and coaches started trickling in today around 8:00am and the first thing that most of them do is head straight to the kitchen where a breakfast spread awaits them. 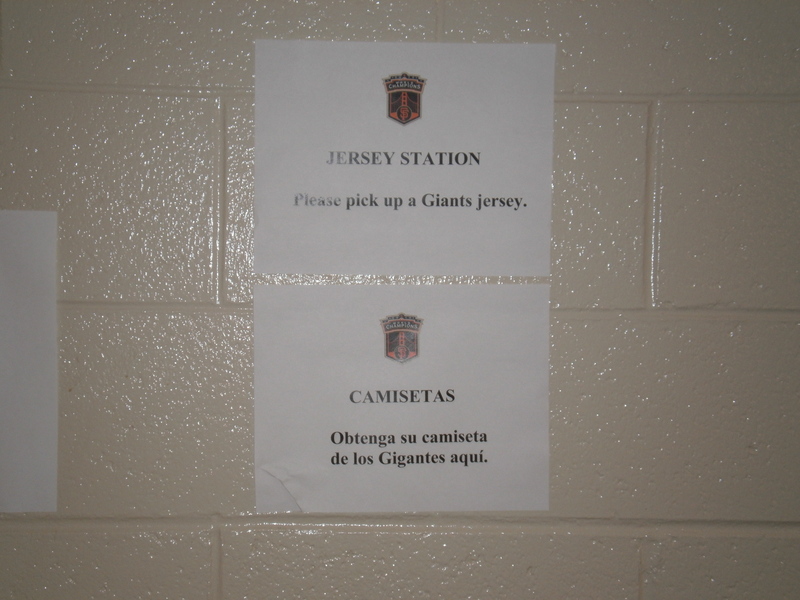 After eating they’ll get dressed in their Giants gear and hang around the clubhouse, reading the newspaper, playing with their ipads or getting a card game going. 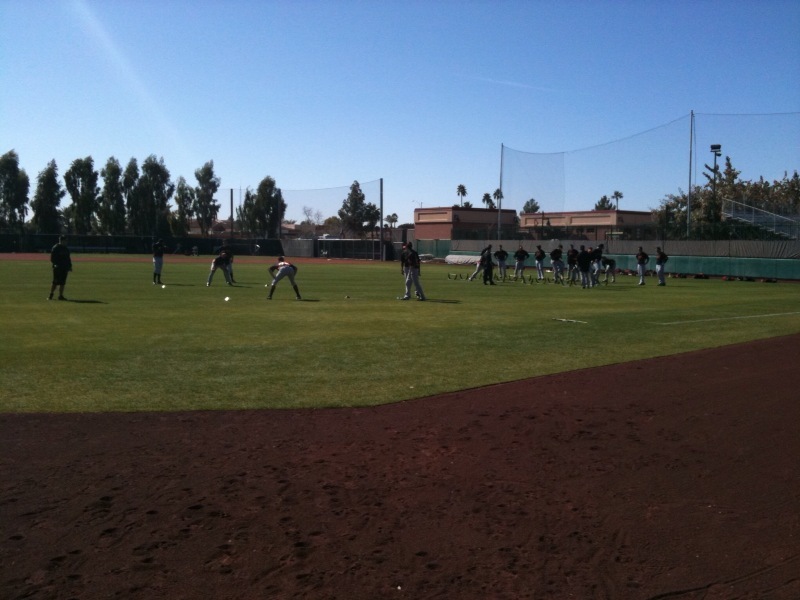 Most of them too will try and get a quick workout in before practice at 10:00am. The clubhouse is also open to media starting at 8:30 so today several writers, columnists, and TV reporters were roaming around the clubhouse knocking out interviews. One thing about being the World Champions is that the media coverage grows and today is the perfect example as national writers from ESPN, USA Today, The Sporting News and cbssportsline.com were all in attendance. 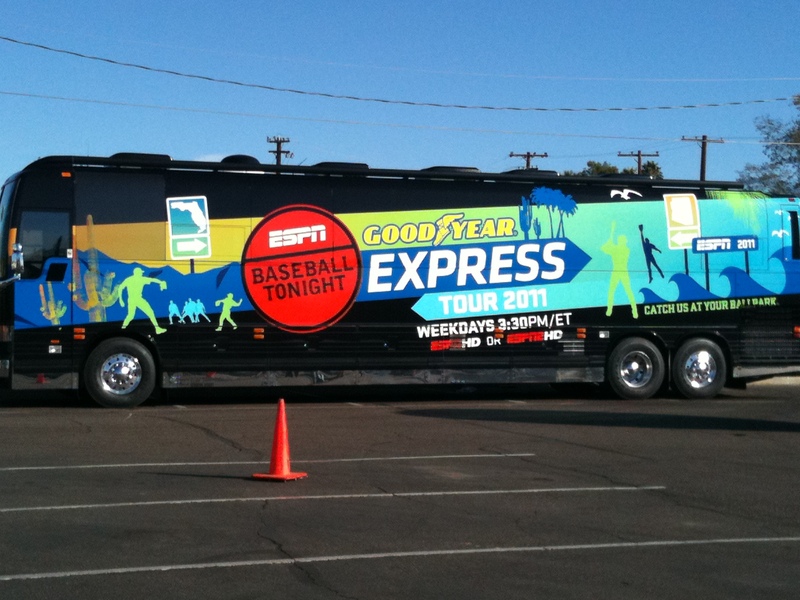 Baseball Tonight’s Spring Training Bus Tour parked in the centerfield lot early this morning as their first stop was Giants’ camp. 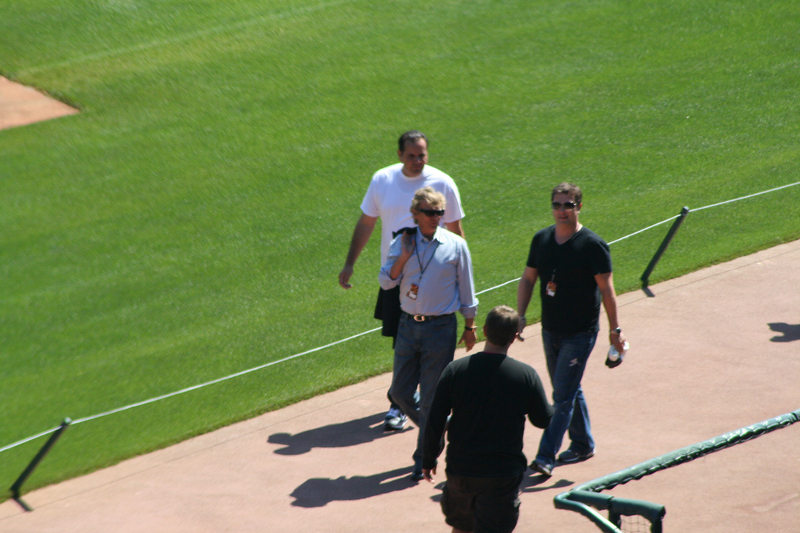 Tim Kurkjian and John Kruk were on hand, interviewing players such as Cody Ross and Brian Wilson. 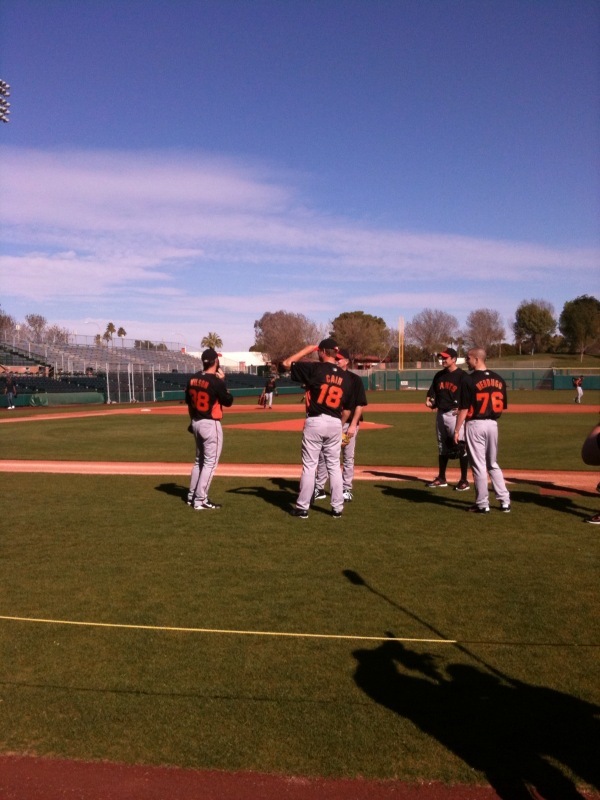 After 10:00 hit, Bochy held a brief meeting with the team and then the players hit the field to warm up and loosen their arms. 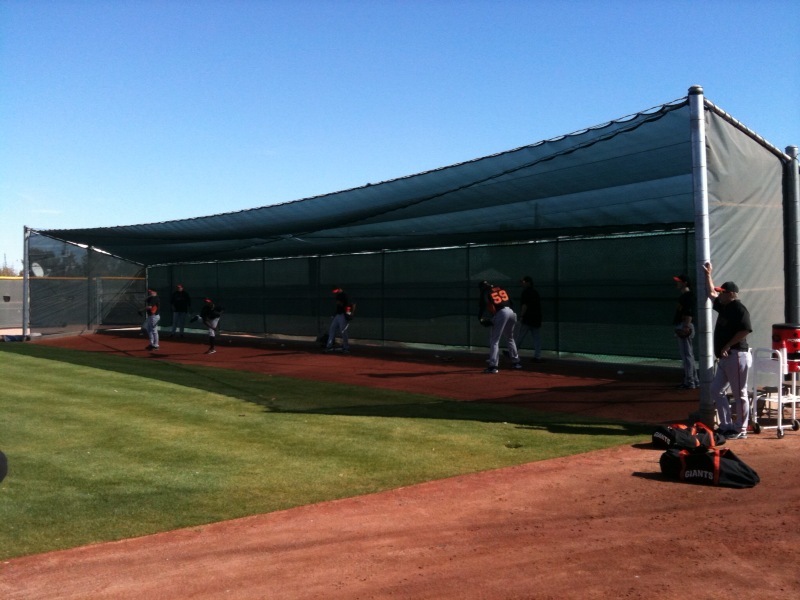 There are three fields at Scottsdale Stadium where the players rotate every 12 minutes or so working on throwing from the bullpen, fundamentals, bunting and PFP’s (pitcher’s fielding practice). 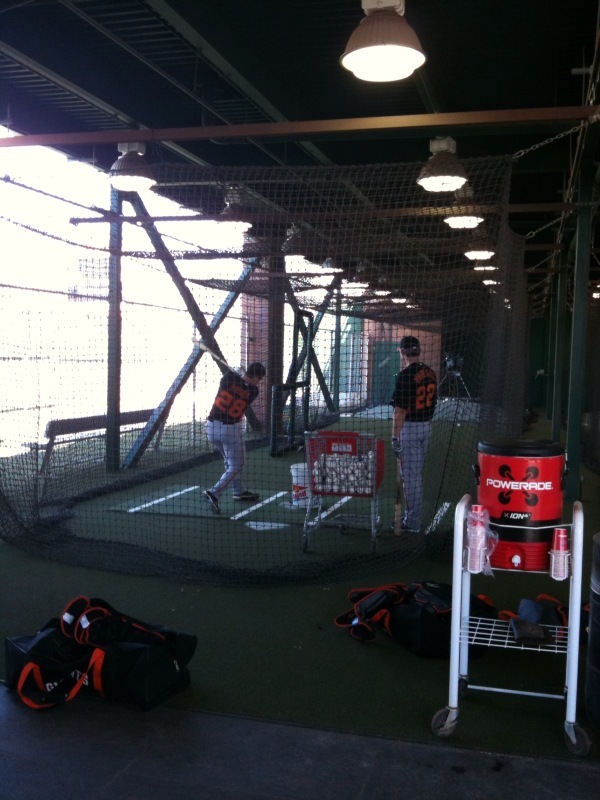 The catching crew helps with the bullpens, get their defensive work in and then hit in the batting cage. Following the stations, 30 minutes of conditioning work is done led by Giants trainers and then by 12:30 the day’s complete. 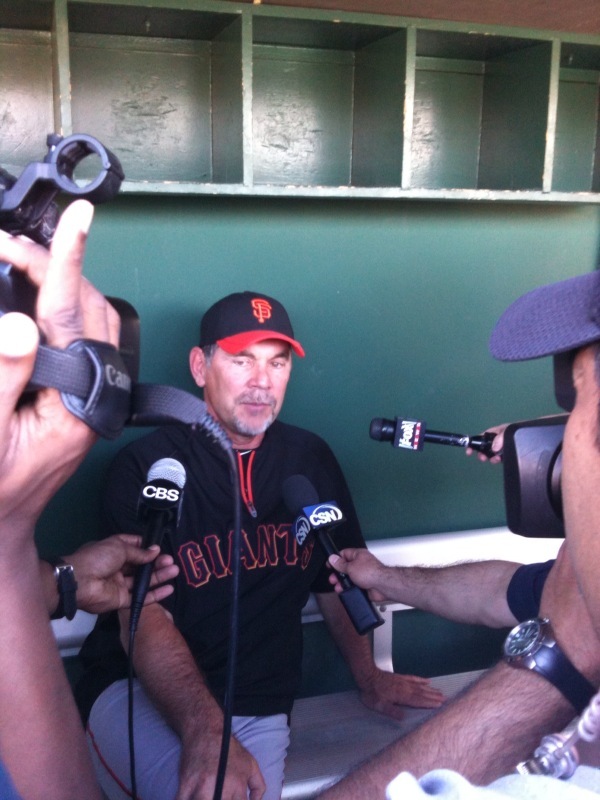 Bochy will meet with all the media to discuss the day’s events and players will shower, eat lunch and then go work on their golf game. 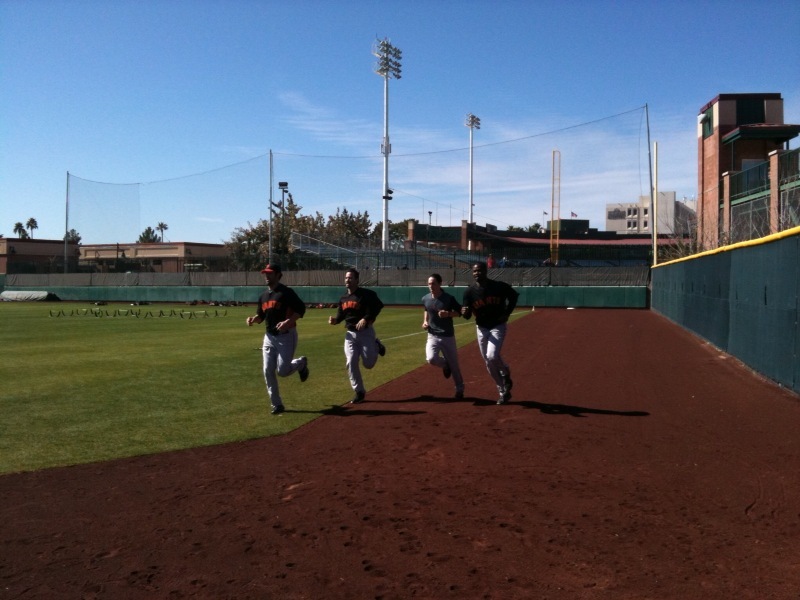 Once the position players report on Friday the workouts will last a bit longer. 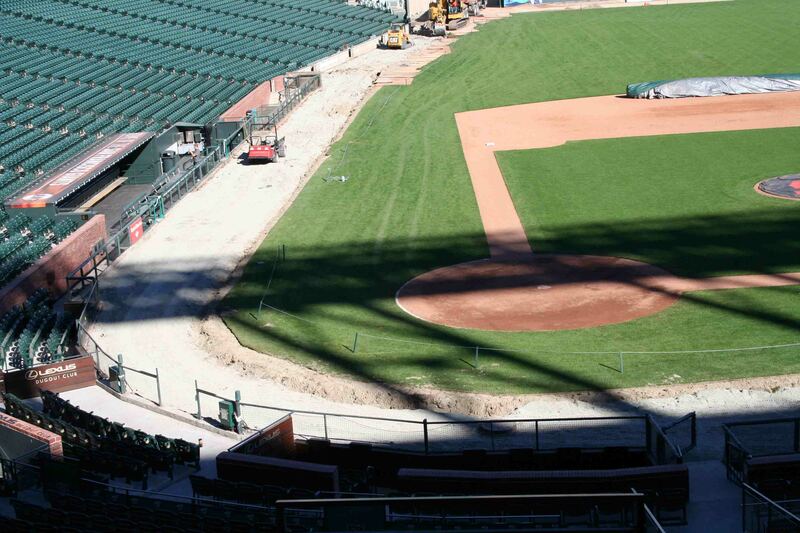 SFGS: How long does field preparation take leading up to Opening Day? 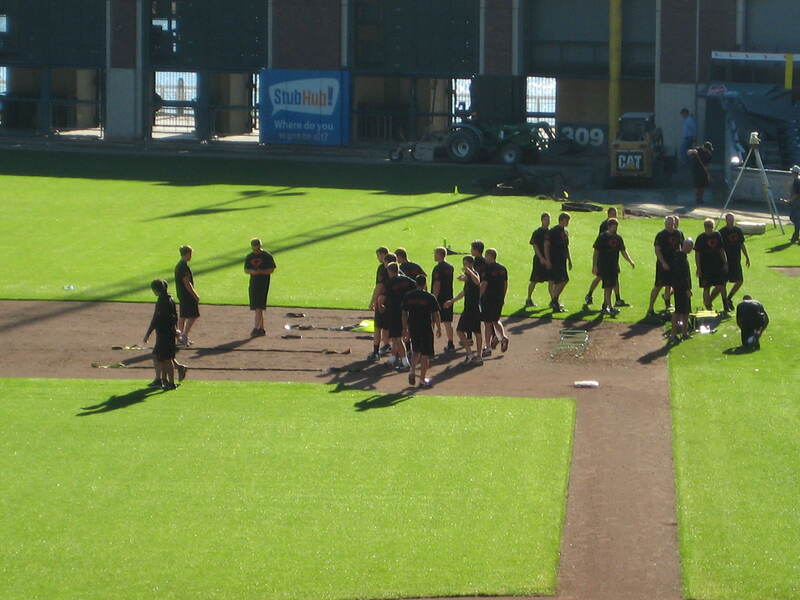 GE: On average it takes about a month to prepare the field. This varies each year depending on what state the field is in. But the grounds crew is continually adjusting and modifying the field each year all year long to keep a consistent playing surface. SFGS: On average, what are the steps you take in preparing the field? What comes first, middle, last? 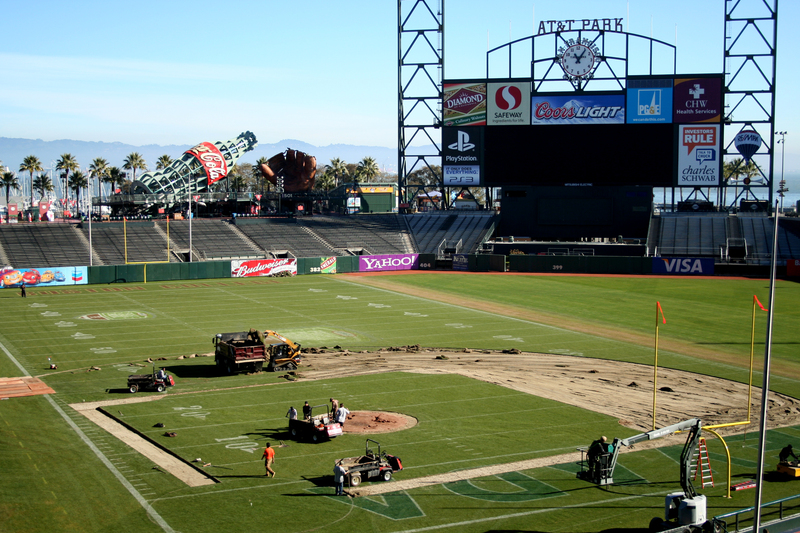 SFGS: When will the field be officially ready? SFGS: Any new features we should look out for? GE: Yes! 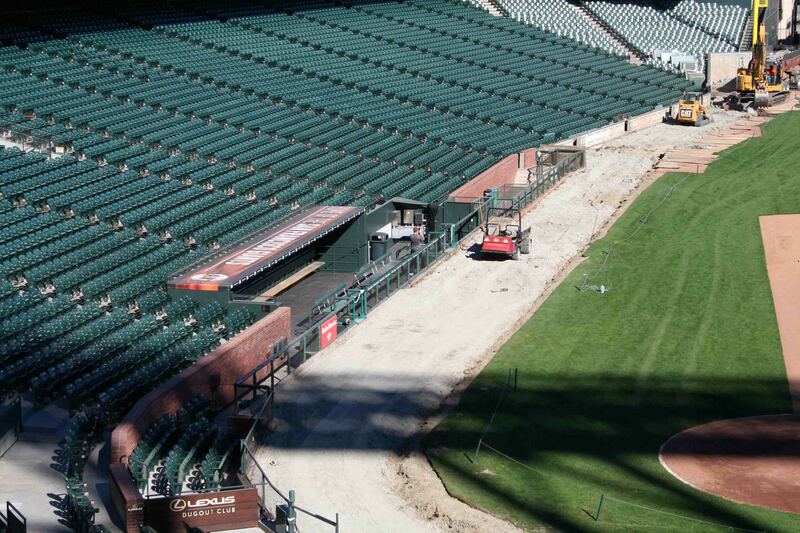 Make sure to check out the Giants newly installed warning track. It’s specifically designed for the Giants. 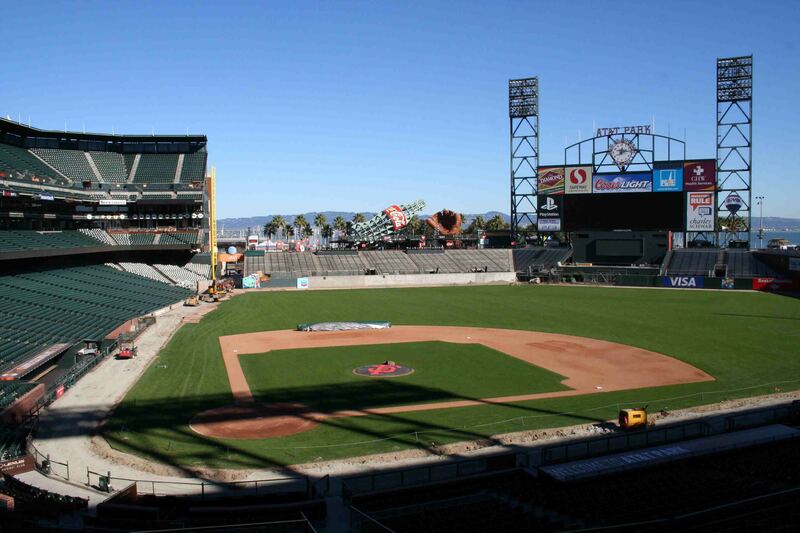 SFGS: Any lawn care hints or tips to give the Giants Fan gardener enthusiasts out there? GE: Use sustainable products. Build your soil & the plant will respond. 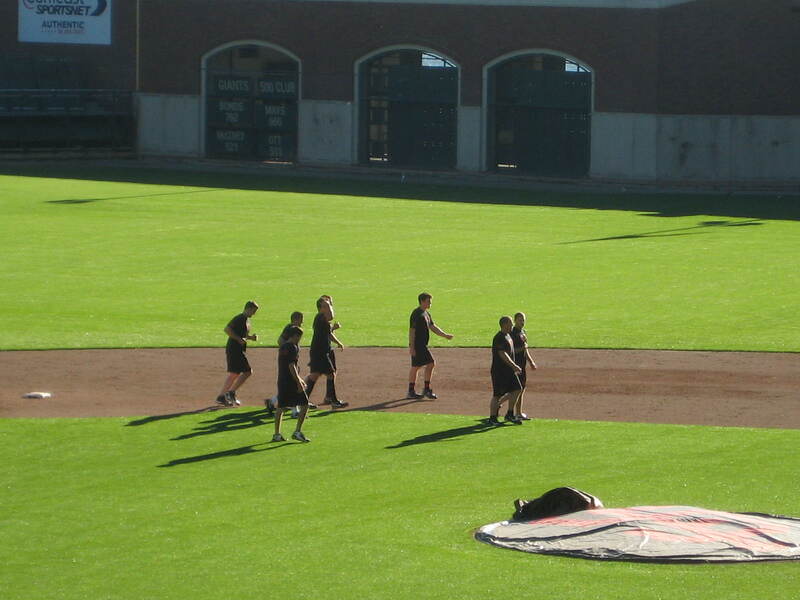 As you can see, a lot of preparation is put in to making the field great. 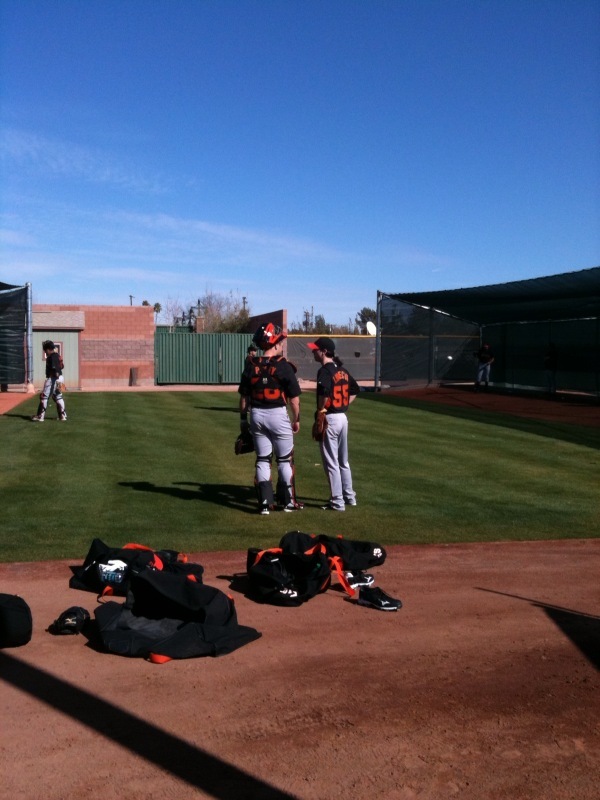 Speaking of, what are you doing to prepare for 2011 Giants baseball? Children and Children and Children OH MY! 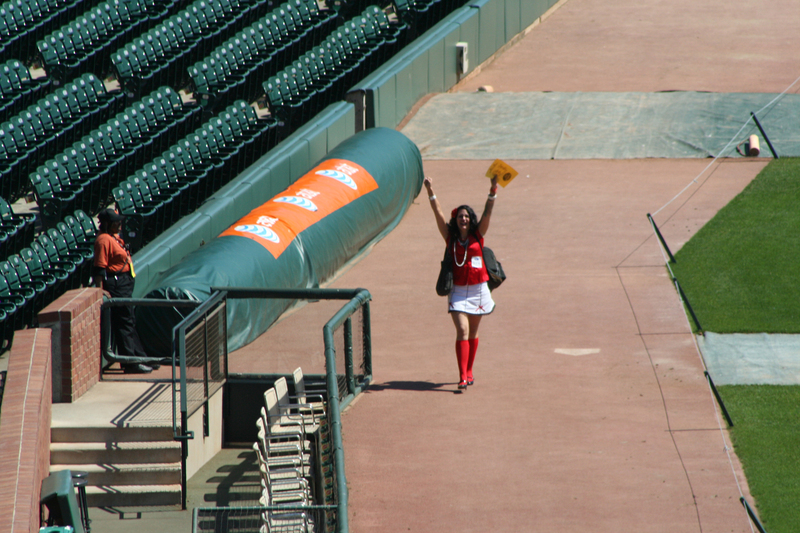 We want to let you in on a great tradition that the Giants do for their employees. 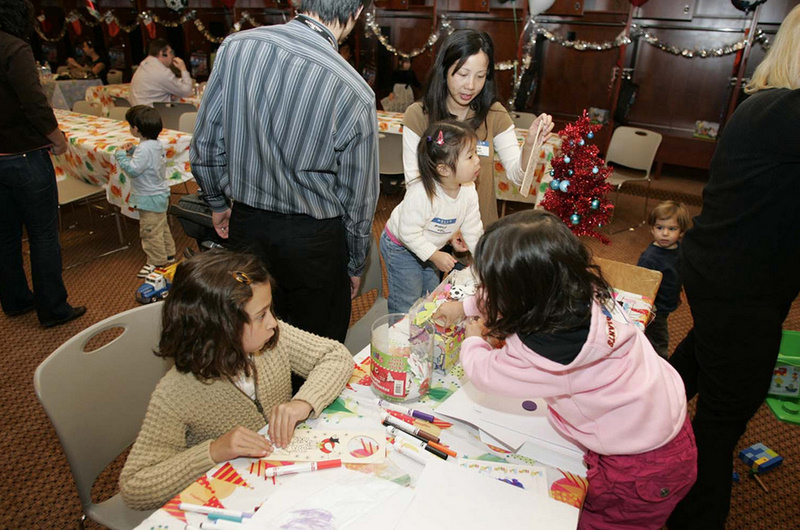 Around this time every year, the Giants front office puts on an event called the Giants Children’s/Toddlers Reception. The reception started 5 years ago because employees wanted a chance to meet all of the babies that were born that year in the Giants front office. Throughout the years, the party has evolved into somewhat of a social reunion, allowing fellow coworkers (with and without children) to not only gather and spend quality time together, but to watch each other’s kids grow up. Some employees have witness infants turn into 5 and 6 year olds, which is a pretty cool thing. 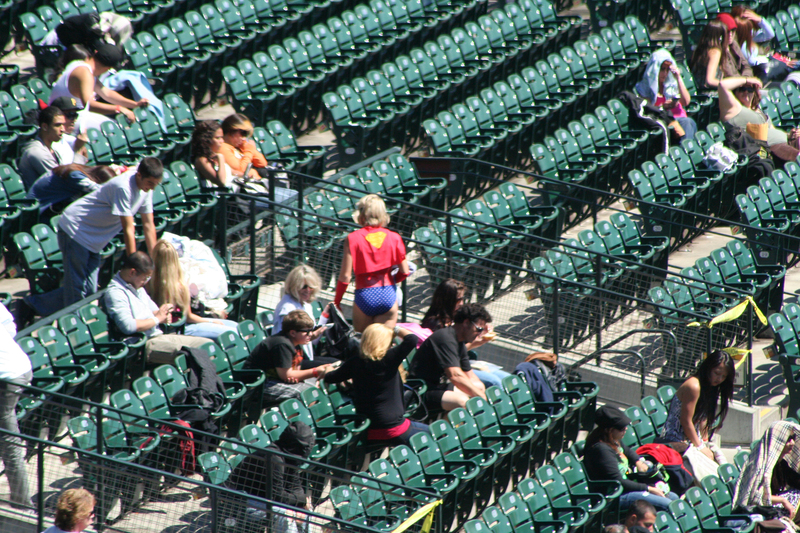 On average, the 2-hour reception is attended by 60 adults and 30-35 kids. Needless to say, the clubhouse at times can feel like a daycare center. Does your work do something similar? How about a company BBQ? Tell us your stories! Pretty quiet day so far on the Giants front as far as trades/rumors go. We’ll see if anything picks up over the next couple of days. 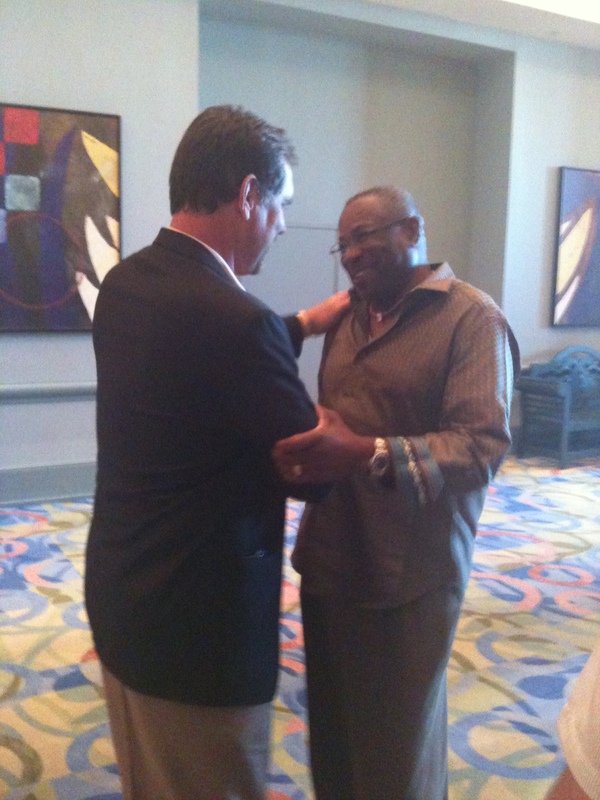 Earlier today, Pat Gillick was elected to the Hall of Fame by the veterans committee, so congratulations to him. Several members of the Giants organization, including Bruce Bochy, Brian Sabean, the baseball operations department, pr staff and top scouts, attended an awards luncheon today as Baseball America announced San Francisco as the Organization of the Year. 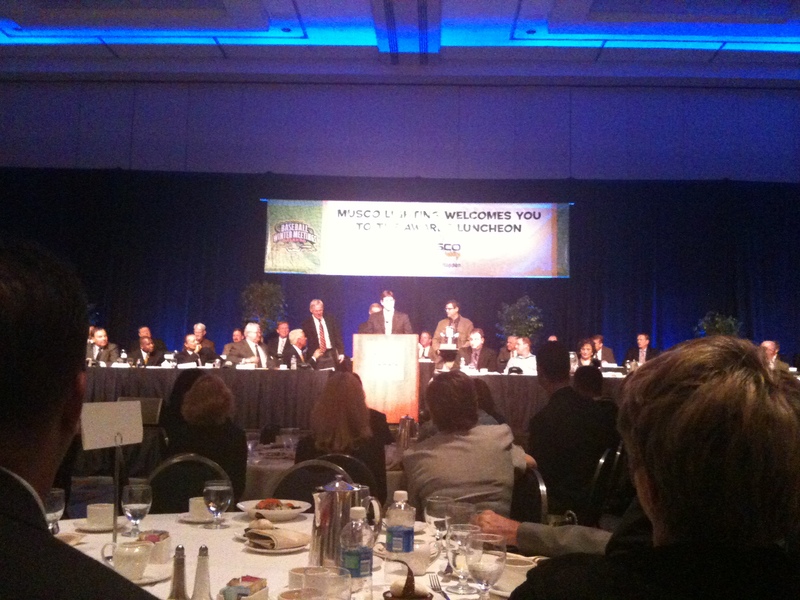 It was nearly a two hour lunch with several awards being handed out, such as Scout of the Year, the best field and turf members at each minor league classification, Women of the Year, and finally the top minor league teams at each level. 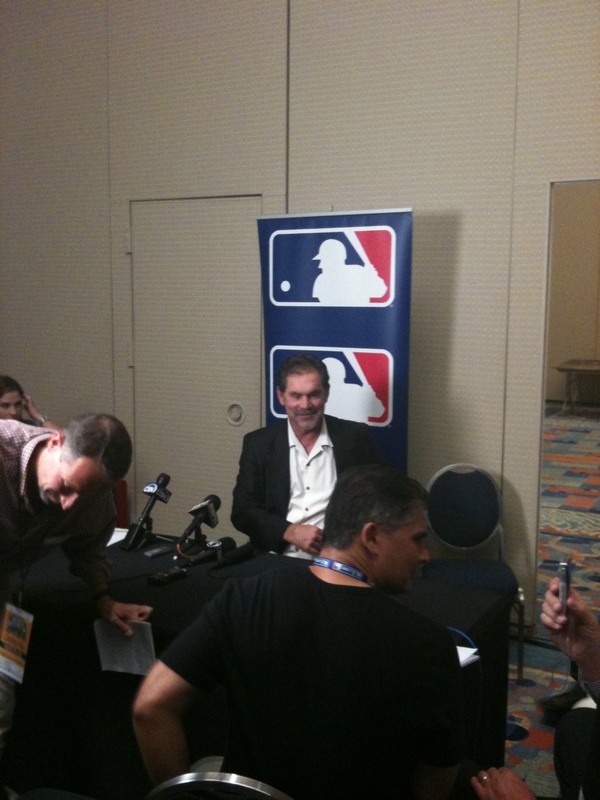 Following the lunch manager Bruce Bochy did a one-hour media tour, speaking with local and national writers, XM Radio, cbssportsline.com, ESPN, MLB.com and then finally finishing with MLB Network. Tonight, the Giants will host an organizational dinner in a ballroom at the Dolphin and Swan hotel with all their affiliates in attendance, including staff members from Fresno, Richmond, San Jose, Augusta and Salem-Keizer. It should be a fun night. 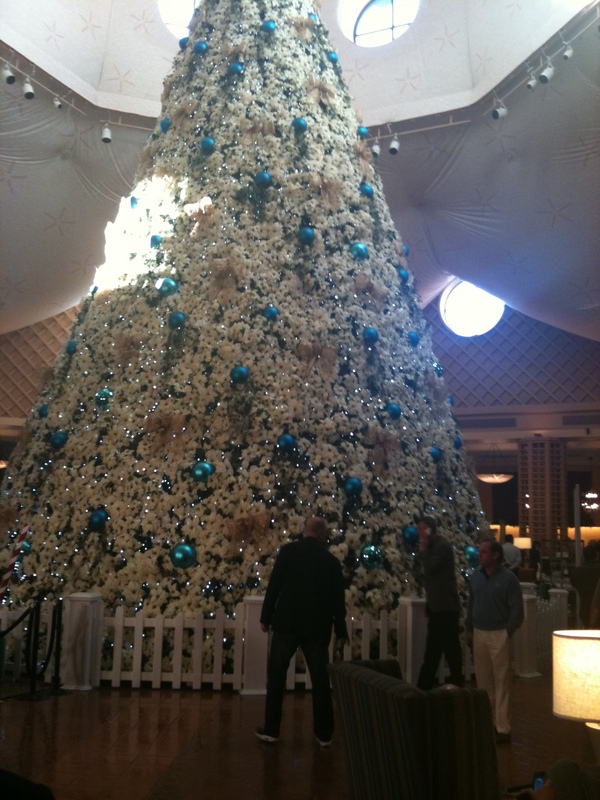 Can you believe it is already mid-November? That’s what happens when the Giants season ends on November 1st and holds a parade a few days later. 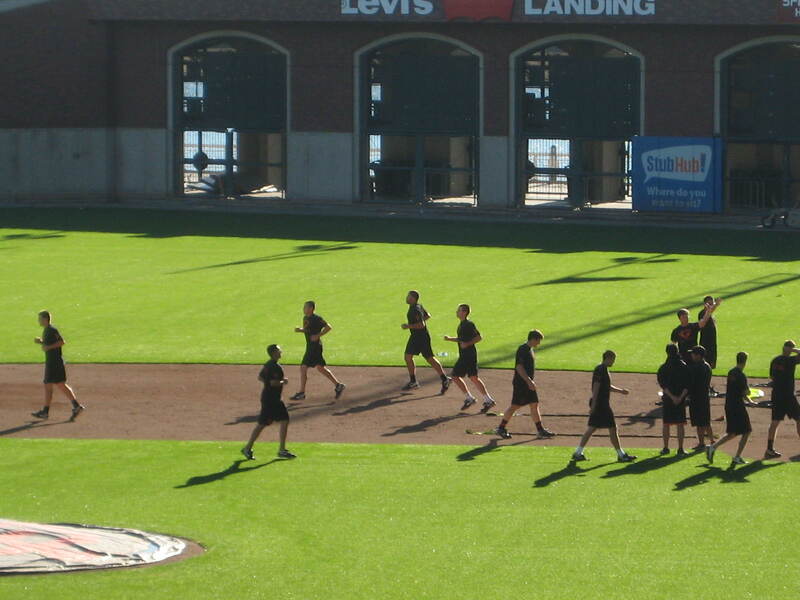 We wouldn’t trade it for the world, but there is work to be done on the 2011 season, and your SF Giants are already full steam ahead. 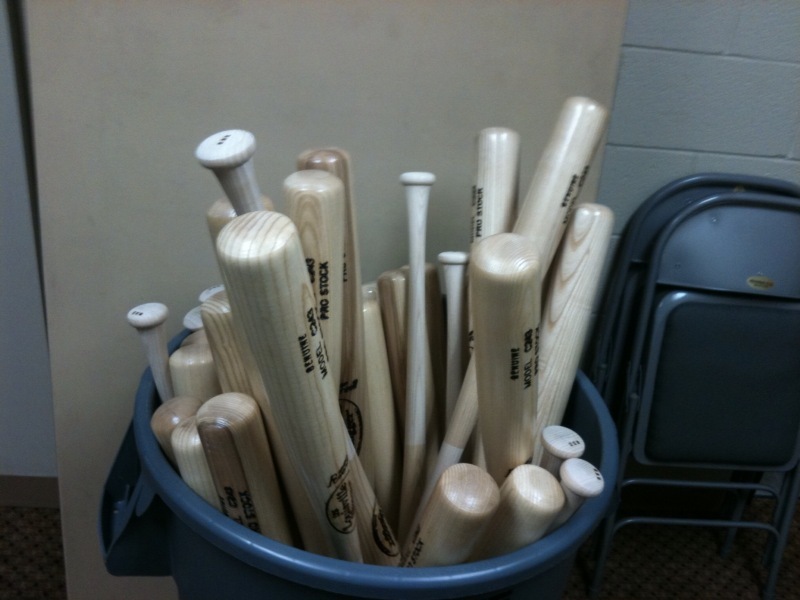 Working in baseball, one of the top questions we get asked, “What do you do in the offseason?”. 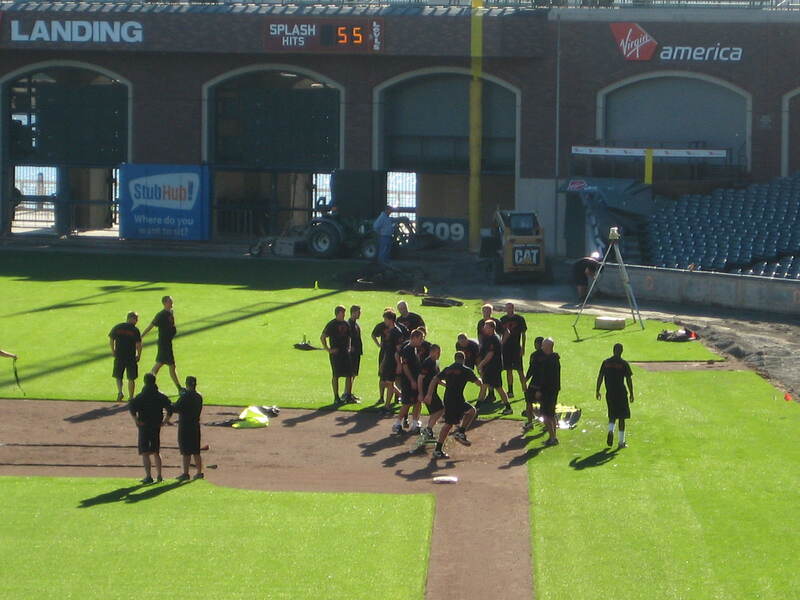 There really is no OFFSEASON in baseball, as every department spends countless hours preparing for the upcoming season. 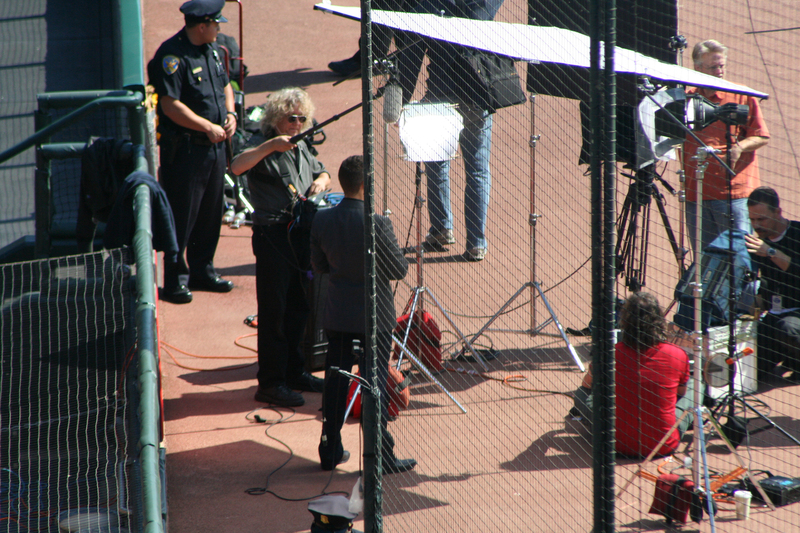 Whether it’s the baseball ops department retooling their roster, promotions department planning their events and giveaways or the production team putting together a 2010 season documentary (More on that in coming weeks). This blog will keep you updated throughout the winter months, give you some behind the scenes access and even a sneak peak of some of the plans coming to the spring of 2011. 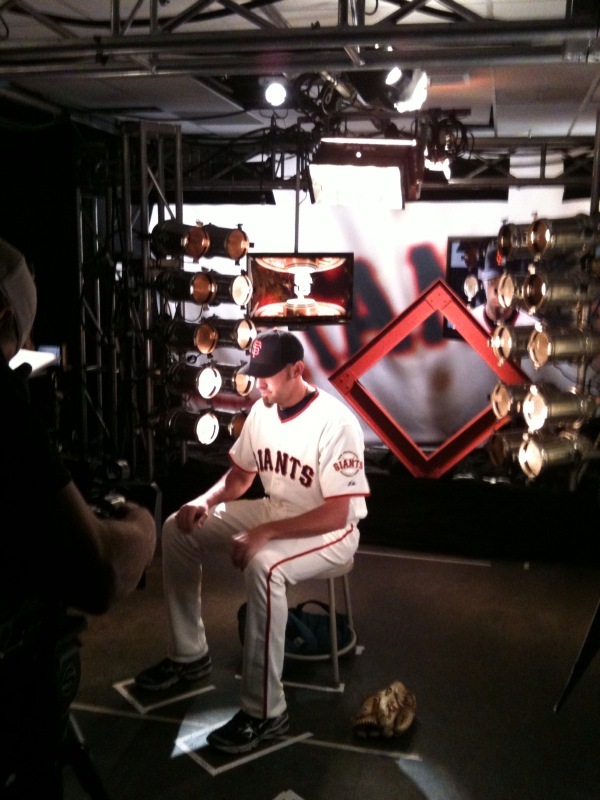 Stay tuned for info on the Giants Winter workouts….And as we write this, another honor for the Giants family. 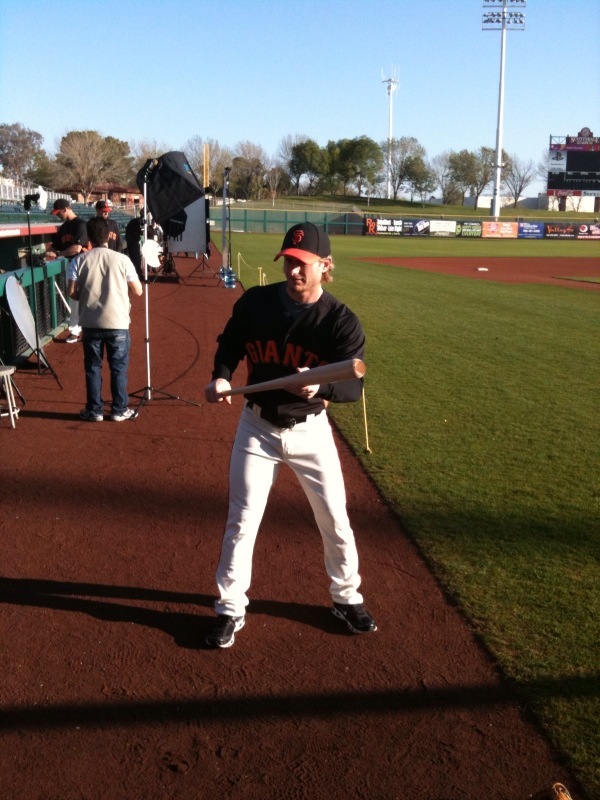 Congrats to Buster Posey on becoming the 2010 NL Rookie of the Year! 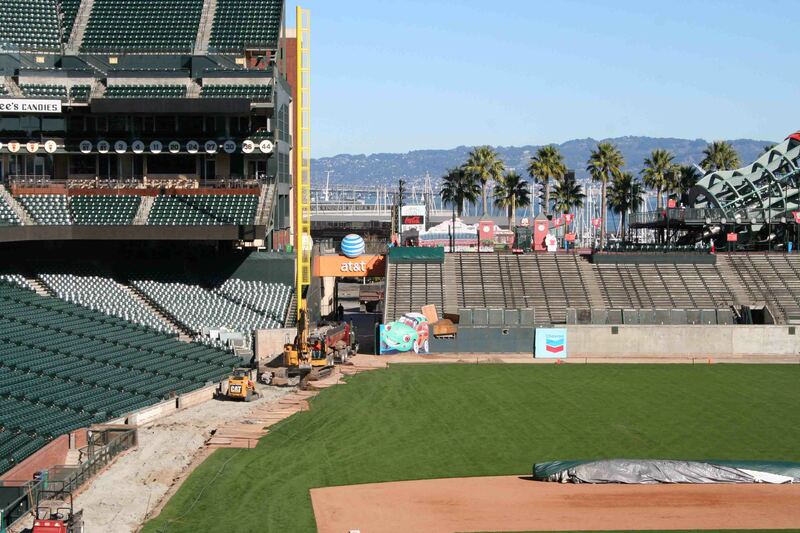 Opening Day is going to have a very busy pregame! Hey Fans, guess what! 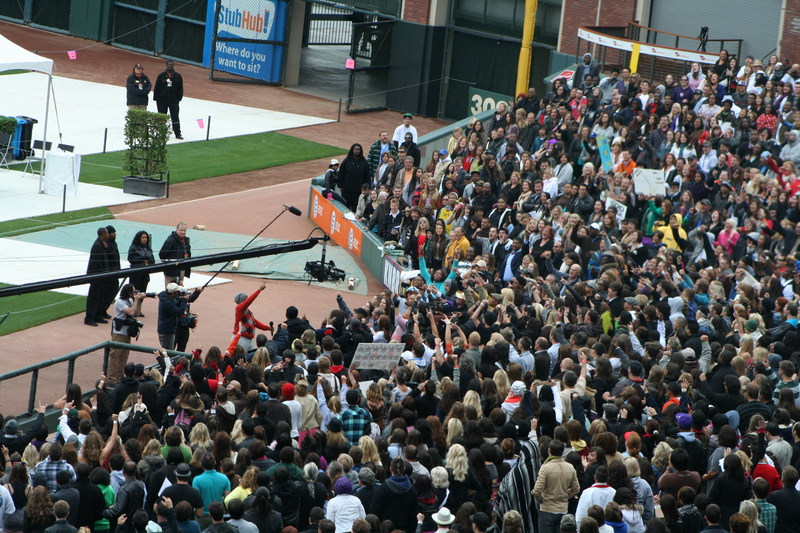 Auditions are being held at AT&T Park this very moment for American Idol. 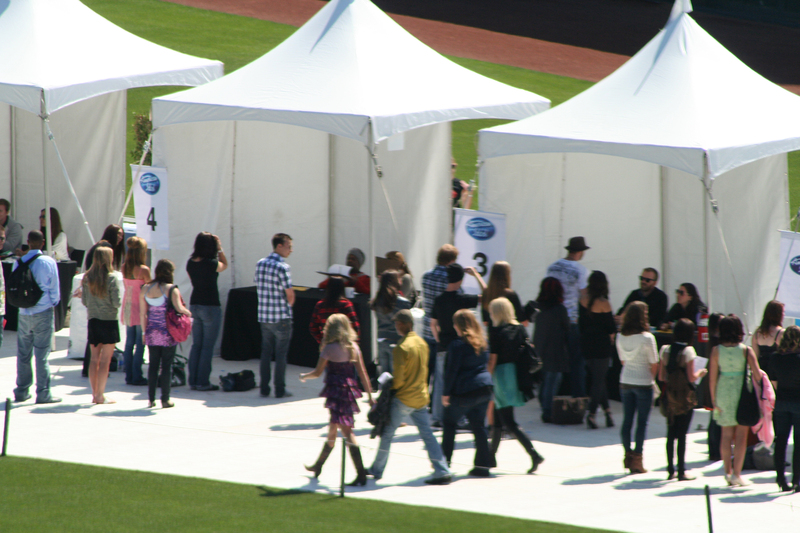 Registration is closed, but check out these pictures I took of the hopefuls, Production crew, Seacrest and Executive Producer Nigel Lythgoe! Are you a fan of AI? If so, who is your favorite past winner? Mine has to be Carrie Underwood, gotta love the song “Before He Cheats”. 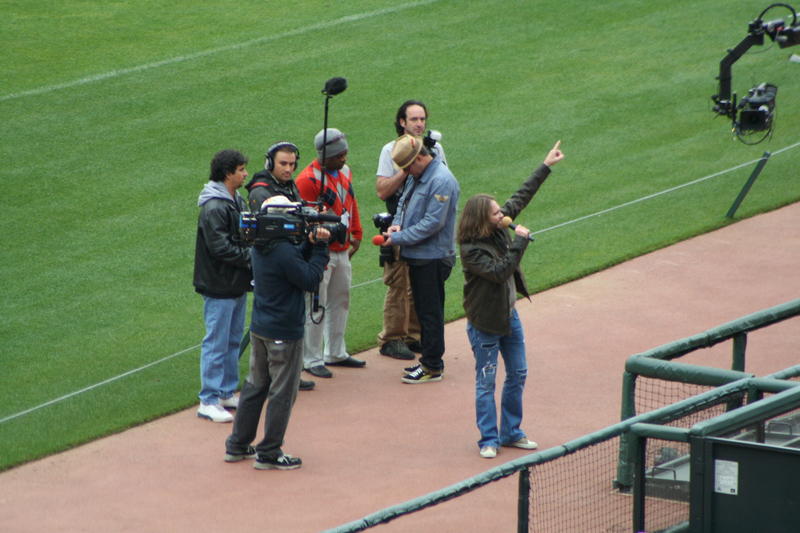 Also, you can’t go wrong with Kelly Clarkson either, she can definitely belt it out! Are you’re a fan of the crazy/kooky auditions? Who is most memorable? 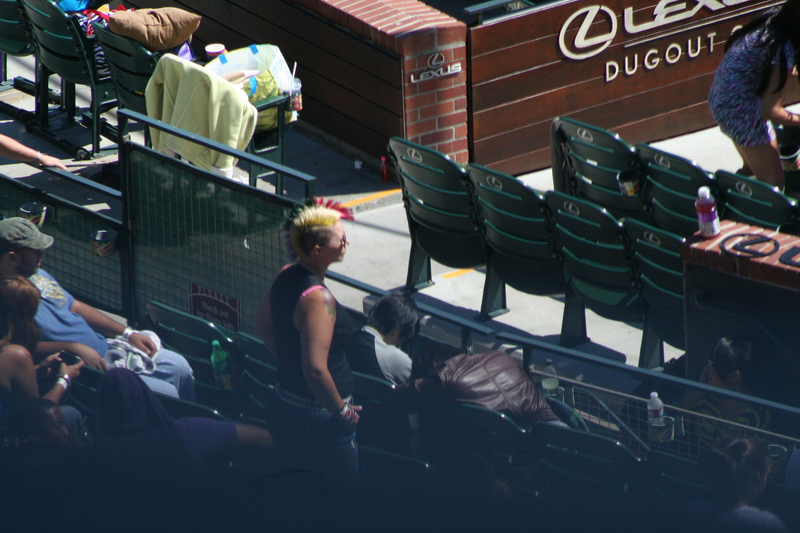 Do you remember dropout Berkley Student William Hung who made the song “She Bangs” popular again, or General Larry Platt who coined the hit tune “Pants on the Ground” in last year’s season? And who can’t forget Adam Lambert who auditioned in San Francisco and was runner up in last year’s competition. 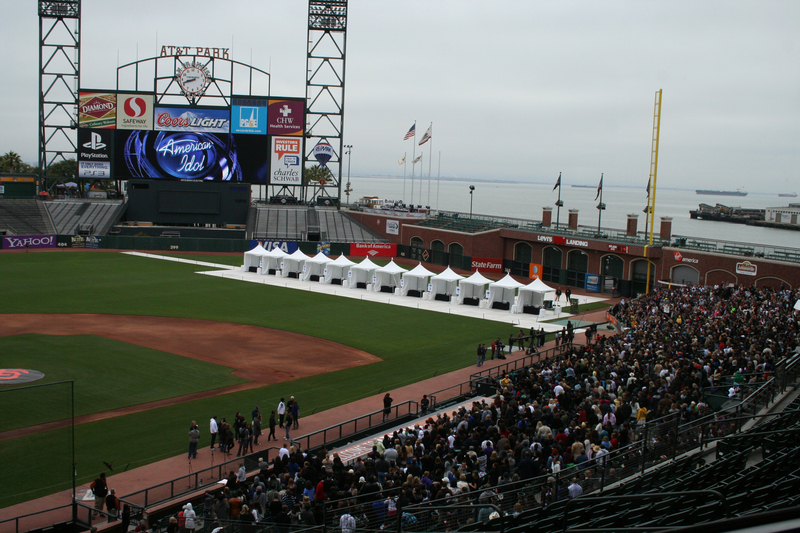 You never know, maybe this season’s (Seacrect voice) NEXT AMERICAN IDOL could come from San Francisco!